Marilyn Brown argues that far from being separate from societal developments, gardens in Scotland are, and always have been, inextricably linked to aesthetic, social, technological, economic and political attitudes. Tracing the Scottish garden to a wider European movement, this extract gives insight into some stellar examples in Iona, Glasgow, Angus and elsewhere. The garden and its companion, the designed landscape, are important elements in the cultural history of Scotland. They also form one of its more ephemeral elements; subject to constant variation on a small scale, they are, on a larger scale, relatively easily changed or abandoned, leaving little or no trace. The creation of gardens, and the form of garden adopted, provides insights into the culture and philosophy of the society that designed and produced them. Like any other art form the style of a garden mirrors the aesthetic, social, technological, economic and political attitudes of the time. More than this, they intimately reflect the personality and ideals of the individuals who created them, and chart the changing fortunes and ambitions of successive generations. Through its gardens Scotland may be seen as part of a wider European movement, drawing on the same literary and visual influences and sharing a common medieval, renaissance and early modern heritage. The first gardens usually discussed in Scotland are those of the monastic communities, which colonised the west of Scotland , and the islands of the Hebrides in particular, from abbeys in Ireland. Iona, the most prominent of these, was founded by St Columba about 563. 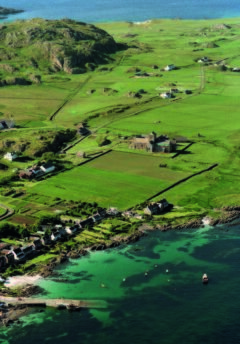 This aerial view of Iona Abbey shows the remains of the monastic vallum or boundary bank around monastery. There are indications of organised enclosures within the vallum, serving different functions for the running of the community. Herb gardens were not restricted to monastic houses. 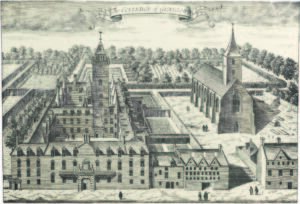 The University of Glasgow, founded on the High Street in 1451, had various gardens – a little meadow, an Old Pedagogy Yard, Paradise Yards, West Yards and a great orchard. The Old Pedagogy was for growing vegetables and for supplying fowls for the kitchen and common table. There was a small physic garden nearby. This engraving by John Slezer shows the university’s orchards and gardens as they appeared in late seventeenth century. Like the dignitaries of the Church, the kings of Scotland were linked to their peers elsewhere in Western Europe. This common cultural background applied to the creation of their gardens, as much as to their choice of music, literature or chivalric display, and gardening in Scotland in the medieval period can be seen as forming a part of a wider European practice. 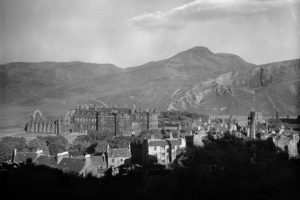 Holyrood was an occasional royal lodging throughout this time, with the abbey employed for major ceremonies and the adjacent park for hunting. One of the earliest references to a garden there is from 1506, when James IV gave five shillings to a Queen of May as he walked to the garden of the abbot. 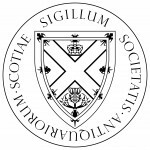 The most obvious change to Scottish society in the later sixteenth century was the establishment of the reformed Church as the official religion of Scotland. Gardens in Scotland illustrated both change and continuity; the fashion for the enclosed garden survives, but grows in size. While food production to support the household remained central, the relationship to the castle or country house becomes more explicit, with the garden arranged to complement the building. 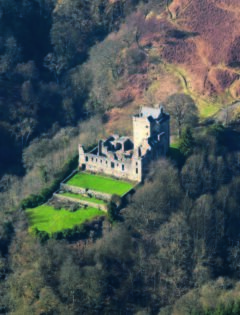 Although designs with a direct axial relationship between the two may belong to the following century, Castle Campbell shows recognition of this form of presentation, which may also have a practical, protective function. The house and the garden express their owners’ changing perception of their country and society and their place in it. The year 1603 saw a major change in the social fabric of Scotland with the departure of the king and court to England. 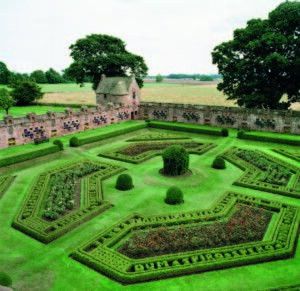 The best known garden of this period is probably that at Edzell Castle in Angus, property of the Lindsay family. This is the most well preserved of the surviving gardens of the early seventeenth century, and provides, through its sculpture, evidence for the elaborate intellectual framework which lay behind its design, and may have extended to the choice of plants. After the peaceful return of Charles II as king, Scotland, which had endured much disruption as the consequence of the battles of the civil wars on its territory, appeared to resume the pattern of social life of the earlier part of the century. The dominance of the landed gentry in this period was epitomised by the construction of country houses and their gardens. 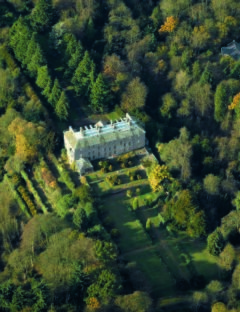 Leslie House with its well-preserved terraced gardens was built in the late 1660s. It belonged to the Duke of Rothes, and was one of the first houses and gardens to be constructed after the Restoration. A cursory examination of the Roy Military Survey, the map prepared between 1747 and 1755 in the aftermath of the 1745 Jacobite rebellion, reveals a country studded with formal gardens and landscapes that stand out against a background of agricultural use. Many of these estates had been newly laid out in the first half of the eighteenth century, and indicate the continuing adoption and desirability of the formal plan. 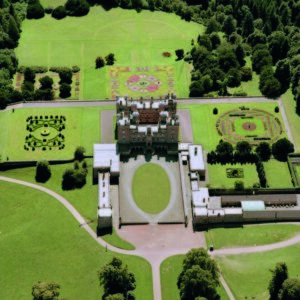 At Drumlanrig Castle, there has been a partial reconstruction of these formal gardens of the early eighteenth and nineteenth centuries. 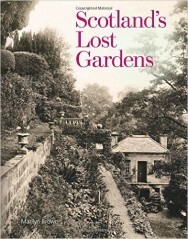 Scotland’s Lost Gardens by Marilyn Brown is out now published by Historic Environment Scotland priced £20. All photographs in the above excerpt are taken from the book. You can see more images from the book here on Books from Scotland.